Copper River Salmon – like bacon, only better! Around here, we eat salmon. And, fortunately for us, we can have wild sustainable salmon all year round. At this time every year (May-June) fresh wild Copper River Salmon from Alaska is everywhere! Okay… yes, it’s shipped via airplane on Alaska Airlines, and I’m sure the carbon foot print is crazy. But I’m sorry, I can’t be that militant with my food. I do my best to make good choices for me and my family, and after all I’m only human. No Mama guilt here! Anyway, which brings me back to the salmon… (By the way, for those of you in Seattle area the price has come down from $25-$30 per pound to $9.99 per pound at QFC and $8.99 per pound at Costco!) It’s luscious buttery flesh rich in omega3 fatty acid is a true NW delicacy! And, yes – worth every penny. This is what I do… and I guess, my semi-make-ahead version. 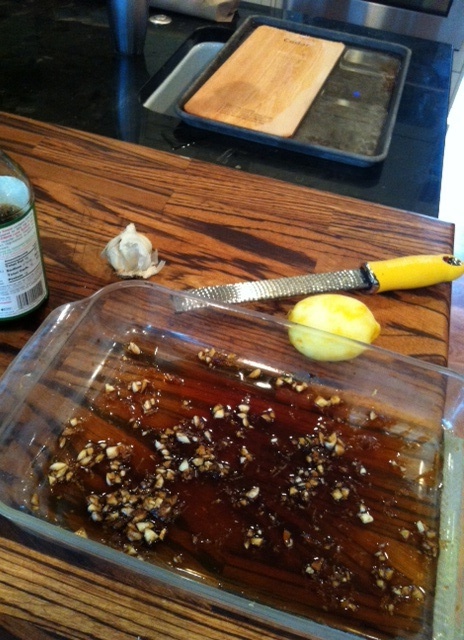 I place the soy sauce, brown sugar, garlic, and lemon in a 9 x 13 casserole dish and mix it all together with a fork – so it coats the whole surface area. Rinse and pat dry the salmon. 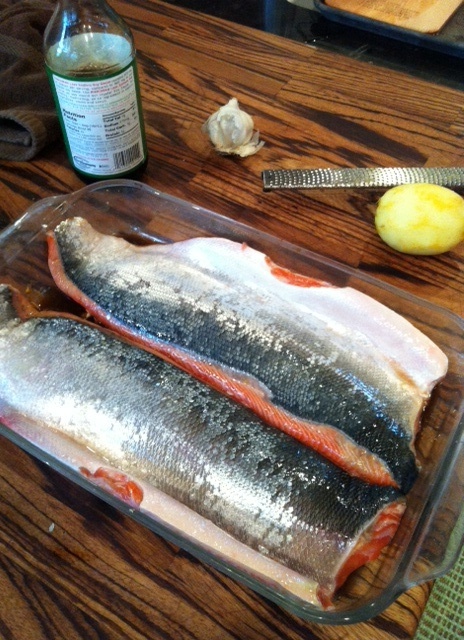 Place the salmon flesh side down (skin side up), in the casserole dish and cover with plastic wrap. This can marinate for a 1/2 hour and up to 4 hours. Soak cedar planks on a cookie sheet (with a lip) for 1/2 hour to up to 2 hours. Heat grill to med-high. Cover and let it heat for 5-10 mins. 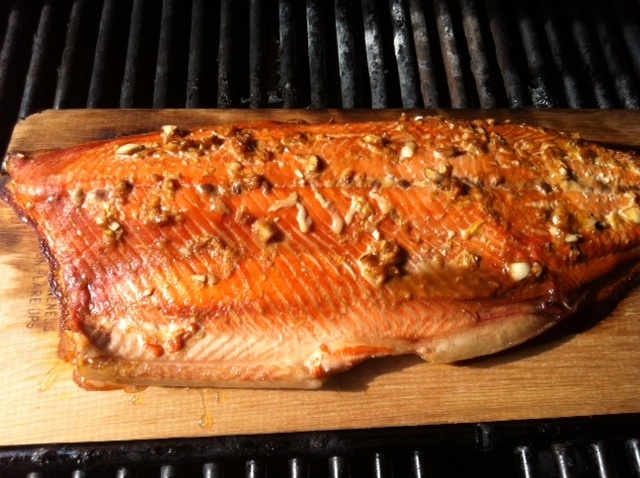 Place Salmon on soaked cedar planks and turn off the burners (only under the cedar) for indirect grilling, cover and cook for approx. 20 mins. This time will make the salmon look a little under done, but feel free to cook to your preference. Leftovers? Don’t let that salmon go to waste! Consider transforming it into salmon and corn chowder (lots of fresh corn right now), asian salmon soup with rice noodles, salmon scrambles, frittatas, salmon and zucchini fritters, salmon sushi, cold salmon and pasta salad… any other ideas??? Feel free to post below!